Distinctive style, superb attention to detail, and the signature of an esteemed artist Handcrafted by master bootmakers, these boots from Tony Lama incorporate the finest exotic materials, exquisitely hand-tooled leather, and cutting edge comfort technology. One of the most popular crocodile leathers, genuine caiman features eye-catching textures created by unique scale patterns. 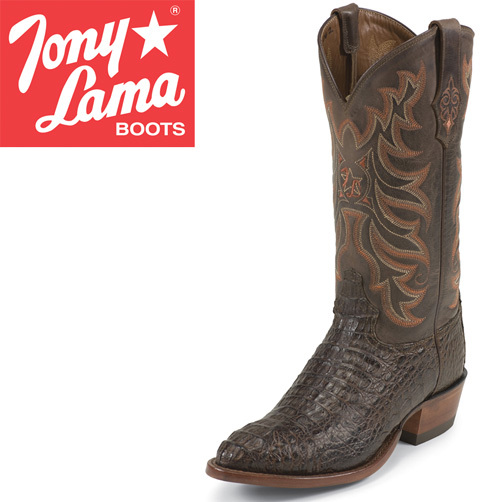 Tony Lama handcrafted caiman boots are not only the epitome of elegance, but they are durable as well. The CZ1062 Chocolate Caimans feature caiman body, tail, and belly cut vamps in a rich chocolate color with beautiful tops. Other features include "R" toe, size 4 heel, 3/4 welt leather, 13" top, and Lama Comfort Technology insole. Color: Chocolate. Size: 8EE.